08104, 00000, "this index object %s is being online built or rebuilt"
A. Real Application Clusters is running on multiple nodes. B. Node failure is detected. C. The enqueue part of the GRD is reconfigured; resource management is redistributed to the surviving nodes. This operation occurs relatively quickly. D. The cache part of the GRD is reconfigured and SMON reads the redo log of the failed instance to identify the database blocks that it needs to recover. E. SMON issues the GRD requests to obtain all the database blocks it needs for recovery. After the requests are complete, all other blocks are accessible. F. The Oracle server performs roll forward recovery. Redo logs of the failed threads are applied to the database, and blocks are available right after their recovery is completed. 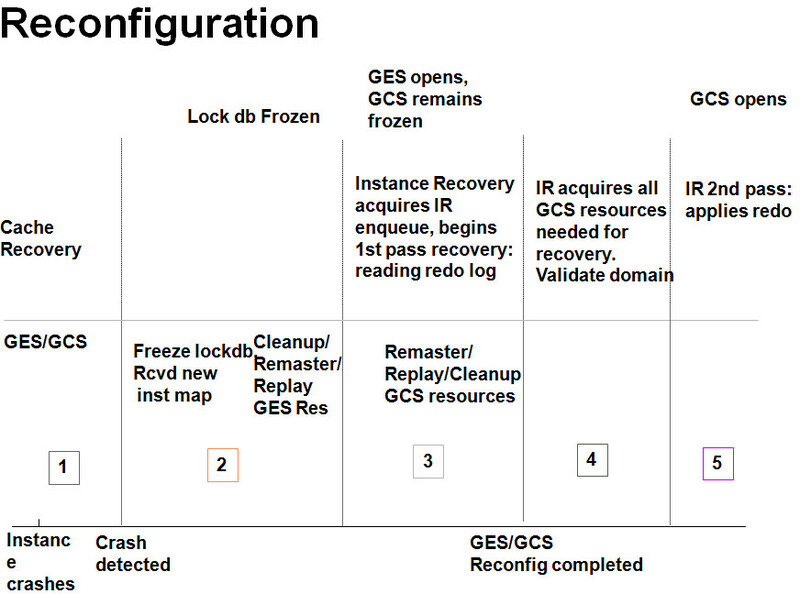 G. The Oracle server performs rollback recovery. Undo blocks are applied to the database for all uncommitted transactions. H. Instance recovery is complete and all data is accessible. 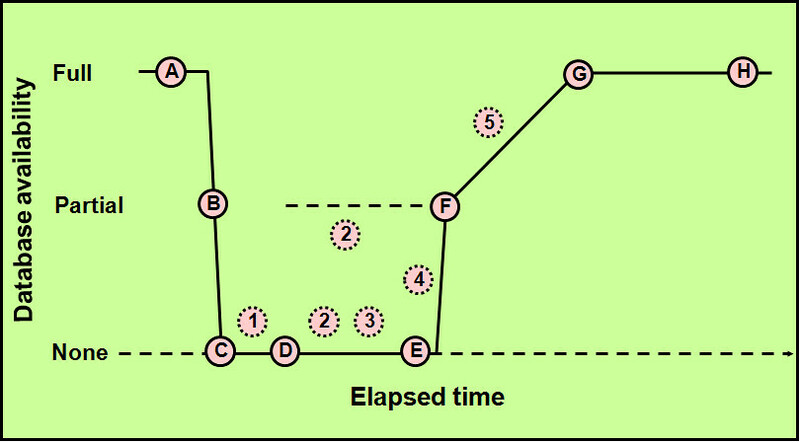 Note: The dashed line represents the blocks identified in step 2 in the previous slide. Also, the dotted steps represent the ones identified in the previous slide. kjxgmcs: Setting state to 4 0.
kjxgmcs: Setting state to 4 1.
kjxgmcs: Setting state to 6 2.
kjxgmcs: Setting state to 6 3.
kjxgmcs: Setting state to 6 4.
kjxgmcs: Setting state to 6 5.
kjxgmcs: Setting state to 6 6.
if reconfiguration is caused by instance death. Delete remote dead gcs/ges locks. Cancel converting gcs requests. Update master info for each enqueue resources that need to be remastered. Enqueue reconfiguration complete. Post SMON to start instance recovery. Starts replaying gcs resources. 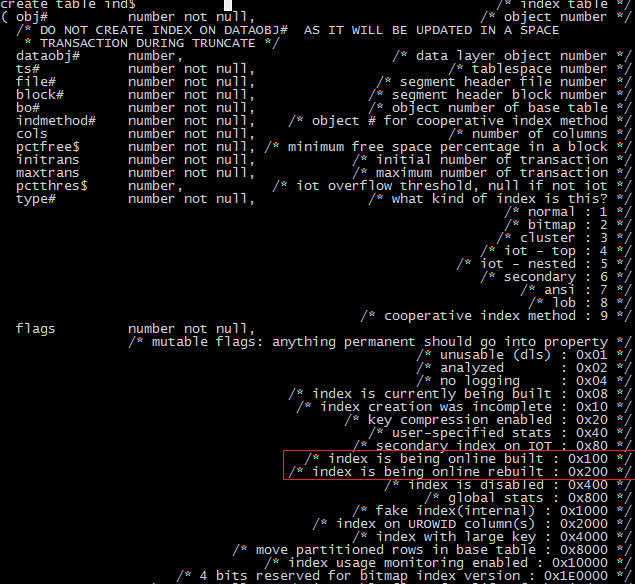 10425, 00000, "enable global enqueue operations event trace"
// *Action: Dump trace for global enqueue operations. 10426, 00000, "enable ges/gcs reconfiguration event trace"
// *Action: Dump trace for ges/gcs reconfiguration. 10430, 00000, "enable ges/gcs dynamic remastering event trace"
// *Action: Dump trace for ges/gcs dynamic remastering. 10401, 00000, "turn on IPC (ksxp) debugging"
10708, 00000, "print out trace information from the RAC buffer cache"
//          TRANSLATED OR DOCUMENTED. IT IS USED ONLY FOR DEBUGGING. 29717, 00000, "enable global resource directory freeze/unfreeze event trace"
// *Action: Dump trace for global resource directory freeze/unfreeze. LMON will dump more informations to trace during reconfig and freeze. event="10426 trace name context forever, level 8"
event="29717 trace name context forever, level 5"
event="10426 trace name context forever, level 12"
event="10430 trace name context forever, level 12"
event="10401 trace name context forever, level 8"
event="10046 trace name context forever, level 8"
event="10708 trace name context forever, level 15"
The dbms_repair.online_index_clean function has been created to cleanup online index rebuilds. Use the dbms_repair.online_index_clean function to resolve the issue. that you have not installed the patch for Bug 3805539 or are not running on a release that includes this fix. which has been created to cleanup online index [[sub]partition] [re]builds. therefore, this is not available in a patchset but is available in 10gR2. until the cleanup has occured. SMON: Posted, but not for trans recovery, so skip it. once the operation is complete.Instead, the extent is simply marked as available for the next sort operation. SMON cleans up the segments at startup. A sort segment is created by the first statement that used a TEMPORARY tablespacefor sorting, after startup. A sort segment created in a TEMPOARY tablespace is only released at shutdown. The large number of EXTENTS is caused when the STORAGE clause has been incorrectly calculated. 01575, 00000, "timeout waiting for space management resource"
// *Cause: failed to acquire necessary resource to do space management. // *Action: Retry the operation. 10357, 00000, "turn on debug information for direct path"
there was code that tried to use the context. 10351, 00000, "size of slots"
// *Comment: of the IO. db_file_multiblock_read_count=16 and event 10351 with level 128.
something related to the async. big ones and so on. Oracle to stop adding blocks to the slot and write small batches. EVENT 10235:"check memory manager internal structures"
7.0 - 10.1.X   Check memory manager internal structures. 7.0 - 10.1.X "Check memory manager internal structures"
Oracle Support Services. Read [NOTE:75713.1] before setting any event. EVENT="10235 trace name context forever,  level LL"
level. This applies to ALL levels except level 65536. The event being set at all causes certain heap checks to be performed. ***   This event should only EVER be set at the request of Oracle Support. ***   It can impact performance on most types of system. ***   Level 2 and above can impact latch contention. ***   Level 3 and above can have a *SEVERE* impact on performance. leaked memory appears to be a leak of "perm" memory. 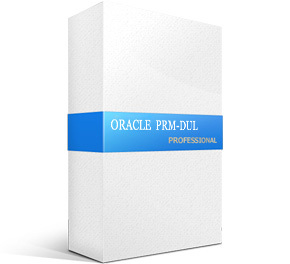 There are additional values which Oracle Support can use. corruption but this can impact performance too much to be useful. EVENT:10052 "Stop SMON from cleaning up obj$"
Setting event 10052 stops SMON trying to clean up OBJ$. object entries created for negative dependency reasons. only performed on selected nodes. @ they are not child dependencies of anything. 7.0 - 8.1.7 "Check data block integrity after each modification"
Oracle Support Services. Read <Note:75713.1> before setting any event. EVENT="10211 trace name context forever, level 10"
Event:10211 enables index block integrity checking. mark the block as corrupt. which is written to the redo stream. See <Note:32969.1> for more detail of various block checking features. for the error which is signalled. This is a special EVENT code. It should *NOT* be used unless explicitly requested by ST support. to confirm which operations occur where in the execution plan. It dumps the predicates into a special table. in the schema of the person running under event 10060.